Miley Holsteins is home to three generations who care for their 250 Holsteins and 450 acres of cropland. This multi-generational farm family takes pride in the care they provide to their cows and the achievements they have made in improving their herd. Joe: The most rewarding part is everyone is able to work here together toward a common goal. It’s the little things, like raising calves. In two years, you get to see what they turn out like, and that’s a pretty rewarding feeling when you get to be part of that. What are common questions you get asked about dairy farming? Amy: Many of our friends have had no idea where their food comes from. We love to talk about it and show people the milking parlor, how the cows are milked and the whole process. A lot of people are concerned about the difference between milk that comes from an organic farm or a conventional farm. We are a conventional farm. Really there’s no difference in milk safety, and one milk is not healthier than another. It’s just two different ways of farming. We drink the milk from our own farm, and we believe it’s safe enough for us to drink, so that gives us peace of mind. Jon: We’d like others to know how hard we work to make sure that their food supply is safe. We spend all of our days making sure our animals are well cared for. The care of the animals and taking care of the land and the environment — all are right at the top of our list. Listen to Jason Miley share his plans for the future of his family’s 250 head Holstein farm. When cows are sick and being treated with antibiotics, how do you keep their milk from entering the milk supply? Jason: Any cows treated with antibiotics are housed separately from the milking herd. Those cows are milked last, and that milk is dumped so there’s no chance that milk gets in with the milk we’re selling. We run an antibiotic test on each individual cow after she has recovered to make sure that there’s no chance her milk is going into the milk supply while there’s still antibiotics in it. 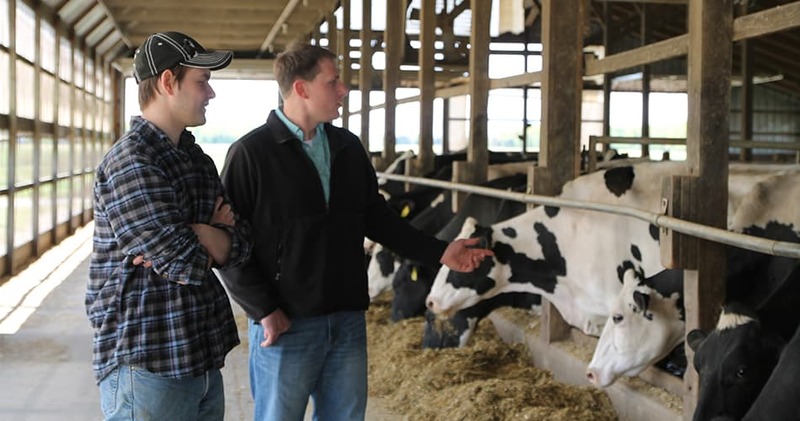 What would you tell other Millennials about being dairy farmers? Jason: We enjoy living out in the country, and we enjoy working with the animals. I think it’s important to understand this is still a business. I enjoy the business side. Instead of working for in finance or in accounting, we’re working with animals. Amy: I would say that we are just like other Millennials. We enjoy most of the same things and care about the same things. We feel so privileged actually to be able to be part of this dairy farm that produces milk and other dairy products for our peers.